Jonathan Stoyanoff is a much in demand bassist who is a fan of, trained in and very proficient at, a wide variety of vernacular music. He attended the Berklee College of Music in Boston, MA on a performance scholarship and, afterwards, Jonathan helped form and performed in a variety of musical projects. In addition, he has played and/or shared bills with jazz, blues and rock/pop greats such as Larry Coryell, B.B. King, Robert Cray, Bill Wyman, Huey Lewis, Dave Mason, Jackie Greene, Ozomatli, Spearhead, The Isley Brothers, Maceo Parker and many more. Mr. Stoyanoff has played at some of the nation’s most prestigious festivals including the Monterey Jazz Festival, the New Orleans Jazz Festival, and the High Sierra Music Festival. 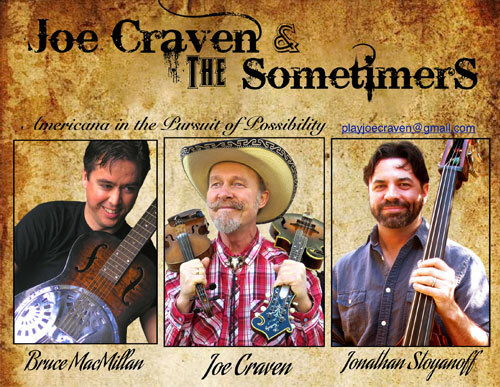 He brings an impressive level of music ability and enthusiasm to Joe Craven & The Sometimers. Bruce MacMillan is a wonderfully intuitive guitarist and vocalist dedicated to the holy temple of American Roots Music. His continued passion for the history and artistry of America’s musical heritage has resulted in a versatility across many musical genres. From Blues to Bluegrass, to Country, Jazz and Rock & Roll, Bruce plays with energy, imagination, and artistry. He has performed upon many stages and at many music festivals, including the Strawberry Music Festival, High Sierra, and California Worldfest. 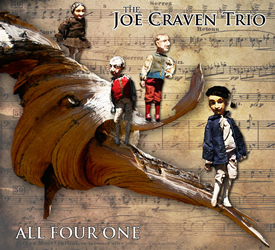 Bruce’s impressive skill set on all manner of guitars, Dobro and lap steel, brings a broad palette of sound to Joe Craven & The Sometimers.